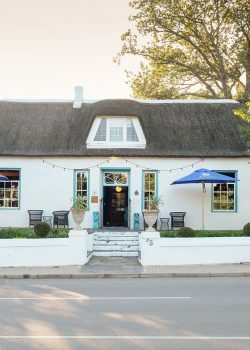 Tour a Victorian cottage that'..
Jongensfontein is a small coastal community situated along the Garden Route. Everyone seems to visit its bigger neighbour, Stilbaai, and so Jongensfontein remains a hidden gem and is perfect for those wanting to get away and experience peace and quiet. You’ll need to venture into Stilbaai to do your shopping and to stock up on supplies. I recommend a visit to the Inverroche Distillery for a superb gin tasting and brekkie or lunch at The Press Room Café. If you have kids then a visit to the Stilbaai Tourism Bureau to see the feeding of the eels is an absolute must. These indigenous fresh-water eels have been living in this pond, which is fed by a natural fountain, for generations. You’ll get to hear about their fascinating lifecycle and take part in the feeding which happens daily at 11am. Afterwards take a scenic walk down to the river mouth.